When do the XperienceCalgary Tours operate? The 2017 season begins May 1 and runs until September 30 for day tours and runs May 12 until September 30 for evening tours. Click here to see our schedule. What’s included with my ticket purchase? Each tour we offer comes with a clean bus, safe driver, energetic and friendly commentary and smiles. What opportunities of employment are available with Round The Block Tours? We are always looking for energetic, fun people to join our team! If you’re interested in employment opportunities, please send an email along with your resume to hr@rtbtours.ca. How can I provide feedback from my experience? We are always interested in what our guests have to say and we read every comment. We are always looking for ways to improve our services. Send us an email at comments@rtbtours.ca . We would love to hear from you! Send us your photos of while you were on our tour and we'll add them to our gallery, or #XperienceYYC on Instagram. You can also submit a review on TripAdvisor or Viator. Do you offer tours to Banff? Yes we do! 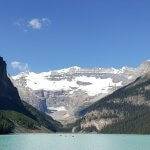 Banff and Lake Louise are beautiful places to visit summer or winter and we wouldn’t want you to miss out. For more information on our tour schedule, click here. If you'd like more information on chartering a bus to Banff, please call us at 1-855-595-1855 or send us an email charters@rtbtours.ca. What if the XperienceCalgary Tours bus is late? Traffic is always a concern when it comes to city tours and Calgary’s traffic can be chaotic. Our routes have been designed to allow our drivers ample time to get around most traffic issues. In some cases we can be between 5 and 10 minutes late. We will make every endeavour to make up this time during the course of the day in a safe and proper manner if possible. 1. Right on our website. Our ticketing system partner offers the highest level of encryption ensuring your credit card information is safe. You can contact us at the number 1-855-595-1855 and we will be happy to help you with tickets or charter inquiries. Your ticket is good for one daily tour on the date you selected. We recommend that you purchase your tickets at least 24 hours ahead of time. When purchasing online or through a concierge in advance, you will guarantee your spot. Do you provide a group discount? What are the durations of the tours? This varies depending on the tour package you have selected. For the city tour only package, the tour will last for approximately 3.5 hours. For the city tour and Heritage Park package, the tour will last for approximately 6 hours. How big are the buses? The buses we wheel around vary between 14 to 24 passengers. They are easier to get around the city and consume less fuel than larger buses! Because of their smaller size, your tour will be more personal, and allow you to see places in Calgary where larger coach buses are prohibited from driving. It is unsafe and illegal to allow our passengers to stand while the bus is in motion. We can make your tour a memorable one with us rain or shine. Unfortunately we have no control over Mother Nature.